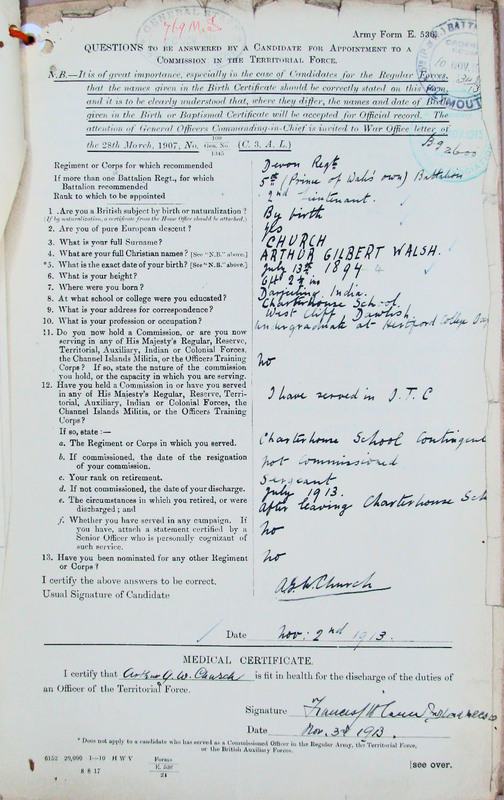 He left Charterhouse in July 1913 and sought a commission in the 5th (Prince of Wales' own) Battalion of the Devonshire Regiment. 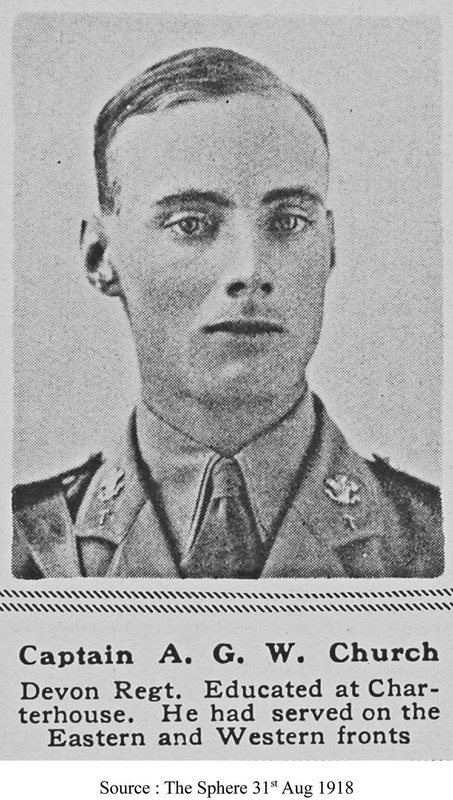 He was awarded a commission as a 2nd Lieutenant on the 10th November 1913. “The Devonshire Regiment 1914-1918” by C T Atkinson shows that the 5th Devons were transported to India in October 1914 aboard the transport “Nevasa” and Lieut A G W Church was among 28 officers and 800 men. On 22 March 1917, 27 officers and 877 other ranks embarked at Bombay for Palestine after spending more than two years on garrison duty in India. They reached Suez on April 4th and proceeded to Ismailia where they re-equipped. In June they went to Deir el Behah for instruction in trench warfare against the Turkish lines. The 5th Devons were next ordered to France and left Egypt on 26 May 1918 in convoy for Marseilles. On arrival they were moved up to the Western Front to join the 62nd Division. On 14 July they were under Marshal Foch to resist a new German offensive south of the Aisne. Arthur G W Church was the second son of Charles Theobald Walsh Church (1860-1937) and Gertrude Rose Birch (1861-1894). Charles T W Church had been born in Dawlish to Frederick Church (1814- ), a retired Royal Navy (officer?) and Emma Walsh (1827- ) who had been born in Bramdean, Hampshire but whose family had been settled at Bridge House, Dawlish, since 1829. Her father, Theobald Walsh (1795-1852) a retired vicar from Dublin, had married Arabella Jackson (1799-1878) and they had eight children including another Theobald and a Gilbert, both of which names recur in the Church family. 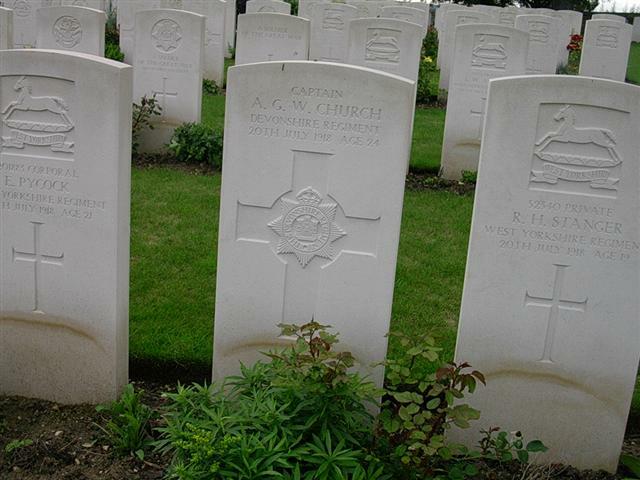 Charles T W Church entered the army in the 2nd Battalion of the Royal Sussex Regiment and was stationed in India where he married Gertrude Rose Birch who had been born in Murree, Bengal. They married in 1890 in Ferozepur, Punjab and he was stationed at Jalapahar, Darjeeling when their second son Arthur was born in 1894. Gertrude died there in the same year but it is not known if the two events were connected. Their first son, Edward Theobald Walsh Church, was also born in Darjeeling, in 1892 and entered the Royal Navy, following his grandfather. UK, Army Registers of Soldiers' Effects.